Spiritual mediums use their psychic powers to contact or channel entities for the purpose of guidance, advice or foretelling the future. Entities contacted by these psychic mediums may be the spirits of dead people, or entities from other worlds and dimensions such as enlightened masters, angels or aliens. Sometimes spiritual mediums claim contact with spirit guides, beings whose purpose is to guide or direct either the medium or the mediums clients towards higher spiritual growth and development. Whether you believe mediumship is possible and psychic spiritual mediums actually can contact spirits, it is a fascinating subject to study. Since ancient times, psychic mediums have used their talents to contact the unseen world. In African traditions, mediums frequently perform rituals to contact the dead and communicate with deceased family members. Western people may be more familiar with the spiritualist traditions dating back to Victorian times that became the forerunner of our modern fascination with spiritual mediums. Spiritual mediums use a variety of techniques to contact spirits. They may meditate and go into a trance in order to contact an entity. Some seem to easily connect with their guides with the questions and answers flowing back and forth like conversations between old friends. 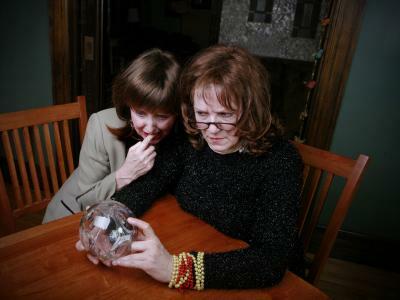 A few use tools, such as crystal balls, tarot cards or other devices to focus their thoughts. Others allow spirits to speak through them, their bodies becoming channels for entities to communicate with the world. Mediums often exhibit clairaudience, clairvoyance and clairsentience, all paranormal abilities related to hearing, seeing and feeling things that cannot be perceived by the normal five senses. Walk into any bookstore or turn on the televisions, and you'll encounter a plethora of information about mediums. While there are many spiritual mediums, a few stand out among others for their notoriety or accuracy. The Fox Sisters: Modern fascination with mediums may have started with the Fox sisters. Kate, Leah and Margaret Fox lived in upstate New York in the mid to late 1800s. The sisters became famous when poltergeist-like raps and knocks followed them wherever they went. They began to conduct séances and soon grew famous for their abilities to contact and communicate with the unseen world. Many years later, however, Margaret Fox admitted the sisters faked the raps and knocks. She later took back her confessions, but famous debunkers like Harry Houdini remained convinced that the Fox sisters were fakes. Read about their fascinating history and the early days of Spiritualism on Prairie Ghost. Sylvia Browne: Although not everyone's cup of tea, Sylvia Browne was a regular on The Montel Williams Show and on Louise Hay's Hay House Radio programs, doling out advice brought to her through her spirit guides and her spiritual medium abilities. Many have claimed that Browne uses tricks to pick up subtle clues when doing readings, and that she isn't a medium at all. Skeptical Inquirer has published several articles critical of Browne, but her fans remain convinced that she's the real deal. John Edward: John Edward appears on his national television show Cross Country every week, bringing messages of hope, love and forgiveness to his audience. His compassionate approach to his work endears him to many. He is perhaps one of the most famous modern mediums due to his television show, personal appearances and private readings. James van Praagh: James van Praagh consults with the Ghost Whisperer television show and uses his abilities as a psychic medium to help people heal from the deaths of loved ones. Jane Roberts: Jane Roberts channels an entity named Seth. Her writings, also called the Seth Materials, are considered some of the most important modern paranormal writings today. In addition to channeling the entity known as Seth, Roberts claimed to channel William James, the painter Cezanne and other famous personalities. She wrote books from her own perspective as well as material channeled through Seth. As a spiritual medium, Roberts began using Ouija boards as an experiment, but soon realized the entity seeking to communicate with her could do so without the use of a tool like the board. The entity later identified itself as Seth, and for over twenty years communicated with her directly on a variety of paranormal topics. In any discussion of spiritual mediums, you may read about how mediums use Ouija boards or enter trance states to allow entities to take over or speak through them. For those dabbling in the paranormal, either activity may lead to negative entities, demons or evil human spirits entering into the person's mind. It's best not to try to contact the dead or other entities. Reading about mediums and their activities may be fun, but it's probably not a do-it-yourself activity.If you're seeking a spiritual medium to contact a family member or friend who has died or you're looking for a psychic reading, be very careful with what you say, and never pay using checks or credit cards. Always pay in cash to protect your personal information from would-be identity thieves. If the medium claims to receive dire messages from beyond but claims she cannot say more until you pay her more money, leave immediately. She may be trying to blackmail or scam you into regular payments.